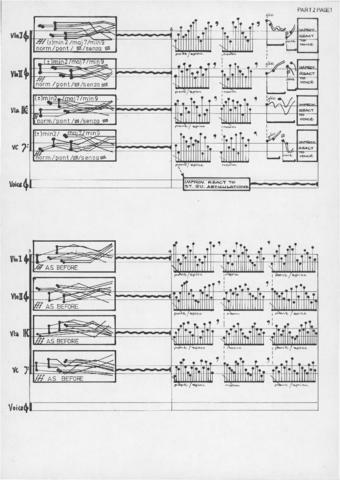 Item is a complete conductor's score for part 2 of Nasca Lines, featuring a string quartet and voice, with occasional contributions from the rest of the orchestra. Part 2 begins with approximated pitches and rhythms, where each instrument's part is written in relation to two outer staff lines and rhythmic values are relational (i.e. no clear metric structure). Some specific pitches are given starting on page 6 and five-line staves are used on pages 10 to 13 and 16. Sections of notated music are interspersed with improvised moments, and the string and wind instruments use extended techniques like circular bowing and multiphonics. The viola part is annotated on page 8, presumably by the conductor and composer, Barry Guy.